A one stop shop for all your material handling equipment, we at Shri Vinayak Packaging Machine Pvt. Ltd, have put in tedious efforts in the research and development line so as to fulfill our clients needs in a satisfied manner. Our products are not only durable but they also have low energy consumption. Under the supervision of our technologically advanced engineers, we have now come up with the Automatic Cup Filling and Sealing Machine. A high end product, the capacity of this machine goes up to 7000-9000 cups a minute, with a filling range of 50-250ml. 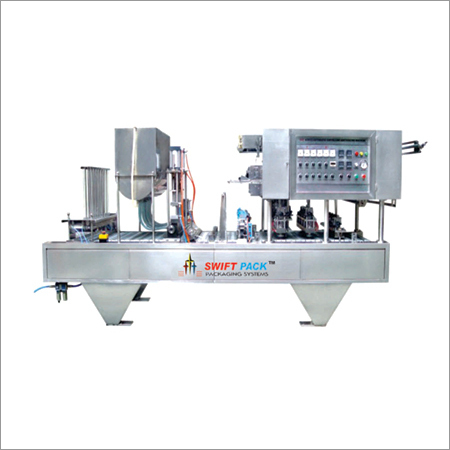 A high selling machine, the Automatic cup filling machine has made us win the trust of a wide range of customers due to it's high power and reasonable price. Having profound technical experience, we ensure the smooth, efficient and trouble-free fully automatic operation of our premium quality products and give a guarantee of safety as well as durability.